Investigators checking the validity of Disabled Persons Parking Placards on vehicle parked outside the L.A. County Fair last weekend issues 71 tickets for fraudulently using the parking passes, authorities said. California Department of Motor Vehicle investigators conducted the enforcement crackdown on Sunday outside the Fairplex at Pomona, 1101 W. McKinley Ave., aided by Pomona police and Fairplex administrators, DMV officials said in a written statement. Of more than 371 placards examined, more than 300 of them, or 81 percent, were found to be valid, officials said. By 71 of them were being used fraudulently, resulting in citations. Pomona Police Chief Paul Capraro echoed the sentiment, adding that it benefits those who truly need to use Disabled Persons Parking Placards. Those caught using the placards fraudulently face fines ranging from $250 to $1,000, and will have the violation noted on their driving records. DMV officials pointed out that not all disabilities are visible, and allegations of improper use of Disables Persons Parking Placards could ultimately found to be unfounded. “The majority of Californians who apply for one have legitimate reasons for doing so, according to the statement. DMV investigators have issued 1,062 citations between April 1 and Aug. 31 during similar crackdowns state-wide, officials added. A man and woman who robbed a La Mirada convenience store of $700 worth of Red Bull energy along with their two young children in a brazen crime caught on camera have admitted to robbery and child abuse charges, authorities said. Elizabeth Kathy Larez, 27, of La Puente and Bryan Gary Corona, 27, of Whittier, were immediately sentenced to jail and prison, respectively, during their court appearances on Friday, according to Los Angeles County District Attorney’s Office spokeswoman Sarah Ardalani. Larez pleaded “no contest” to two counts of robbery and one count of child abuse, while Corona pleaded “no contest” to two counts of robbery and one count of child abuse, Ardalani said in an email. Lares was sentenced to 365 days in county jail and three years of formal probation, she said. A three-year state prison sentence was suspended, but could be reimposed if Larez violates her probation. She was also ordered to attend 52 weeks of parenting classes and barred from possessing any dangerous weapons. Corona received a sentence of three years in state prison, Ardlani said. The charges stem from a June 10 robbery at an ampm minimart at 13550 Beach Blvd., just south of Imperial Highway. The heist was captured on video by store surveillance cameras. Larez and Corona entered the store about 11:30 p.m., accompanied by their two sons, ages 9 and 10, as depicted in the video. The man and woman first distract their clerk while the two boys leave the store carrying cases of Red Bull, the video shows. When the clerk tried to stop the theft, Larez and Corona pelted him with cans of the beverage before also grabbing cases of Red Bull and running out the door. Investigators released the video in hopes of generating clues, and anonymous tipsters soon helped police identify Larez and Corona as the robbers, Los Angeles County sheriff’s Detective David Sotomayor said at the time. Deputies and Buena Park police found and arrested the suspects July 14 at the Portola Inn and Suites, 7921 Orangethorpe Ave. in Buena Park, officials said. The children were placed in the custody of family members. Sotomayor said Corona admitted he had sold the drinks. A mother and her three sons who disappeared from New Mexico, triggering a multi-state Amber Alert, were found safe in the Lancaster area Sunday night, hours after the car the were driving in was found abandoned in La Verne, authorities said. The three boys, ages 6, 8 and 9, were believed to have been taken in Albuquerque, New Mexico during the early morning hours and driven to California by their 28-year-old mother, Laria Walker-Anderson, according to an Amber Alert issued by the California Highway Patrol. They were last seen in a silver, 2009 Kia Spectra, according to the CHP. According to CHP logs, authorities learned of an electronic “ping” indicating the car had been on the 210 Freeway near Foothill Boulevard, just east of the 57 Freeway, in La Verne at 2:28 p.m.
A witness called police shortly after 5 p.m. to report seeing the car listed in the Amber Alert parked at Foothill Boulevard and Ramona Avenue with no one inside, La Verne police said in a written statement. Officers responded and confirmed the car was the one being sought. The woman and children were no where to be found. The family turned up safe in the Lancaster area shortly before 10 p.m., according to La Verne police Lt. Monica Schusse. Further details were not immediately available. Walker-Anderson was not formally accused of any crime on Sunday afternoon, Bernalillo County sheriff’s officials said during a news conference broadcast on the department’s Facebook page. She has legal custody of the children, and no arrest warrant has been issued. But the woman had made threats of possible self harm, or harm against her children, to the children’s father via a phone conversation, and there was believed to be a .45-caliber handgun in the car she had been driving, according to deputies. Due to the circumstances, officials said they wanted to make sure both the children and their mother were OK.
An Amber Alert issued for three sons allegedly taken by their mother in New Mexico was expanded to California on Sunday, as officials received information the involved car was spotted in the San Gabriel Valley, authorities said. 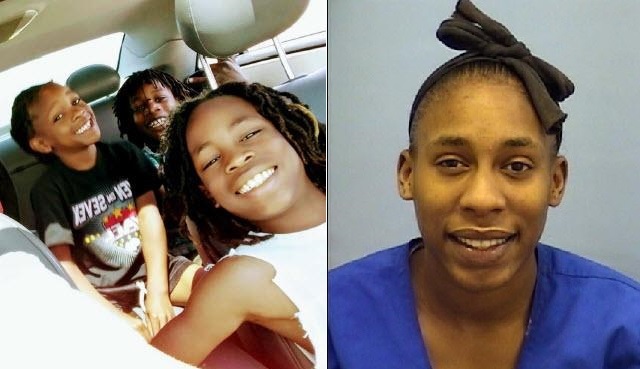 Six-year-old Lexintgon Wyatt and his two bothers, Lakai Wyatt, 8, and Lloys Wyatt, 9, are believed to have been taken in Albuquerque, New Mexico and driven to California by 28-year-old Laria Walker-Anderson, according to an Amber Alert issued by the California Highway Patrol after learning the woman and children may be traveling in Southern California. The suspected kidnapping took place during the early morning hours in Albuquerque, New Mexico. They were last seen in a silver, 2009 Kia Spectra with a New Mexico license plate number of AAYR80, according to the CHP. Walker-Anderson is described as black, 5 feet 54 inches tall, 132 pounds, with brown hair and brown eyes. Lloyd Wyatt is black, 3 feet 5 inches tall, 65 pounds, with black hair and brown eyes. He was last seen wearing “Despicable Me” pajama pants. Lakai Wyatt is also 3 feet 5 inches tall and about 65 pounds, with black hair and brown eyes. He was last seen wearing gray pajama pants. Lexington Wyatt is 3 feet tall, 50 pounds, with black hair and brown eyes. She was last seen wearing yellow-and-white shorts. But the woman had made threats of possible self harm, or harm against her children, to the children’s father via a phone conversation, and she was believed to have a .45-caliber handgun with her, officials said. Due to the circumstances, officials wanted to make sure both the children and Walker-Anderson are OK.
Walker-Anderson had family in Southern California, officials added. Anyone who spots the children, the suspect or the car is asked to call 911 immediately.